Shri Chandra Nursing College (Inst. ),Durg, Chhattisgarh integrates Information and Communication technology into the curriculum, and thus provides the latest resources in this field. Computer and communication network provides state-of-the-art computing facilities. The college/institute has fully equipped Computer labs with more than 10 computers in each. Shri Chandra Nursing College leaves no stone unturned to give the student best possible learning experience. Shri Chandra Nursing College (Inst.) has dedicated staff and team members to make the students dream come true. 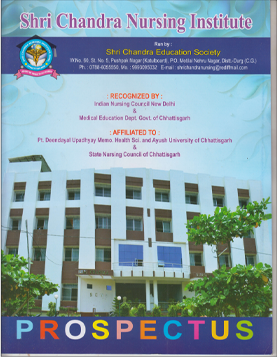 Shri Chandra Nursing College is the best nursing college of Chhattisgarh.